Part 2 in a series of posts where we document 'The Profound Truth' of High Angle-of-Attack (AoA) flight testing of high performance aircraft. 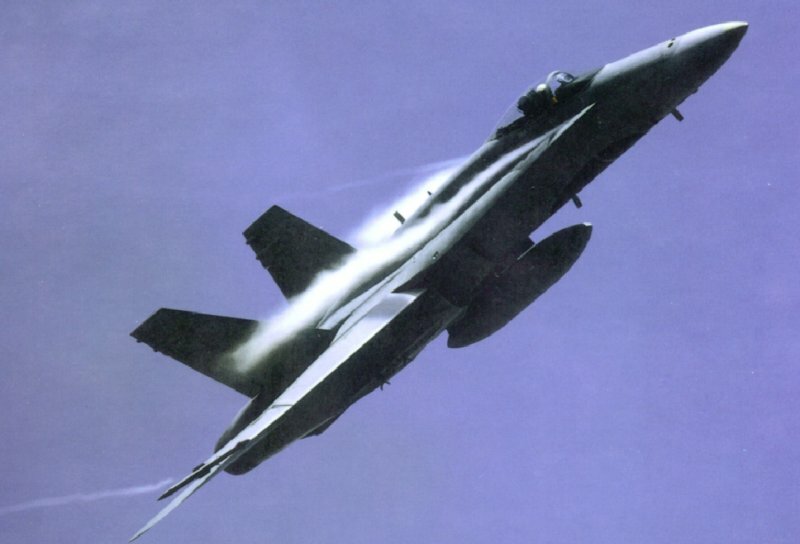 For this post, we will avoid mentioning all other problems the F-18 program dealt with that did not have to do with the High AoA performance, behaviors and testing. They would be helpful highlighting in yet another way, how the F-35 program isn’t as ‘concurrent’ as some would lead us to believe: but I’ll resist the temptation to beat that dead horse (this time). Modest asymmetries increase the departure and spin susceptibility and come with undesirable fight manual limitations on the maneuverability. Large asymmetries impose severe limitations, which must be rigidly observed, thereby reducing the airplane’s safety and operational flexibility (Heller). As an aside, I must add that a detail design engineer on the F-18 program once noted in a lecture I attended that the early F/A-18 (Correction: YF-17) wind tunnel models shed verticals like crazy at high AoA. The model makers assumed it was the models’ fault, so they just built the models stronger. In retrospect, the wind-tunnel models were telling them something. Fortunately, these changes mitigated or eliminated most of the Heritage F-18’s early untoward behaviors, but one in particular remains to this day: the ‘Falling Leaf’ departure mode (aka ‘alpha hang-up’). The mode remains “suppressed”, but as the video below illustrates, still remains a threat to all but the most wary Heritage F-18 pilots. Many of the design objectives behind the F-18E/F were focused on eliminating the extant problems and limitations of the Heritage Hornets. Keep in mind the Heritage F-18’s discoveries when the rabid army of F-35 haters start sounding off. 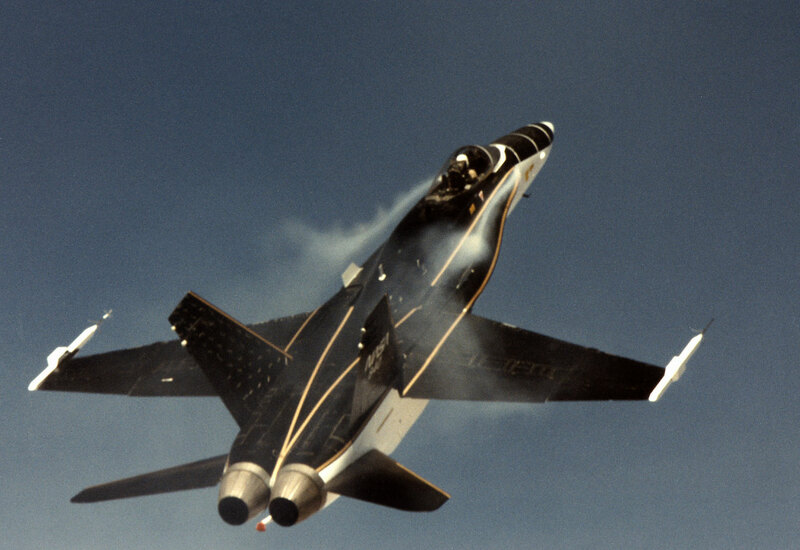 “The Impact of the F/A-18 Aircraft Digital Flight Control System and Displays on Flight Testing and Safety”; Kneeland, B. T. , McNamara, W. G. , White, C. L.; NAVAL AIR TEST CENTER PATUXENT RIVER MD; 1983. “Partners in Freedom: Contributions of the Langley Research Center to the U.S. Military Aircraft of the 1990's”; Chambers, J.R.; NASA SP-2000-4519; 2000. “F/A-18E/F Super Hornet High-Angle-of-Attack Control Law Development and Testing”; Heller,M., Niewoehner, R.J., Lawson, K.P. ; JOURNAL OF AIRCRAFT, Vol. 38, No. 5; 2001. You're only at part one but I'm already enthralled! I know you are currently engaged with this series but I really want to pick your brain on thrust vectoring. I was digging through the F-15 ACTIVE technical reports and only came away unclear (partially because I'm an electrical engineer by training) as to the actual benefits of plume vectoring (it seemed that the plume deflection angles were rather paltry while the reduction in engine thrust output was quite high) compared to the contributions made by the additions of more control surfaces (the articulated nozzles or more generally the paddles/vanes) and improved FCS. Great post...I like the way this is heading.keep it coming. By the way,sorry for being a little bit off topic(again),but have you seen the post on DoD Buzz?Ronmey wants to buy more F-22s if he is elected...I know your time is limited because of your work and your current posts but i would like to know your opinion on this. As to the Romney question. I think it would be a great itdea IF we buy more F-22s in economical quantities. 12 years ago I would have recommended doing that and buying fewer F-35As and more heavy bombers - oh yeah, I DID. With the current and future mix, I'd buy more F-22s and retire F-15s and F-16s, and buy the heavy bombers. I think once Mr romney is in office, his F-22 tune will change (because he will be more informed)but I hope the rest he's cited as saying won't. We should have stopped at 'The Base Force' instead of blowing right by it as the Dems took control in '93. We are still living with Aspin (spit) groupthink concerning the post-cold war era. The main report was "Initial Flight Test Evaluation of the F-15 ACTIVE Axisymmetric Vectoring Nozzle Performance" TM-1998-206558. It's quite unclear just how much the vectoring flaps are contributing to the performance improvements vs. the deflected exhaust plume itself.